Peaks, Plateaus & Canyons Association poses with their Partnership Award for Publication of the Year. The dress theme for the ceremony was Hollywood's Playground in the 1950's. PALM SPRINGS, CA --The Public Lands Alliance (PLA) has announced the recipients of its 2018 Partnership Awards that celebrate the best in public lands partnerships. These awards honor individuals, organizations, publications, products, programs and services that embody leading edge achievements in the preservation of public lands and the enrichment of visitors. 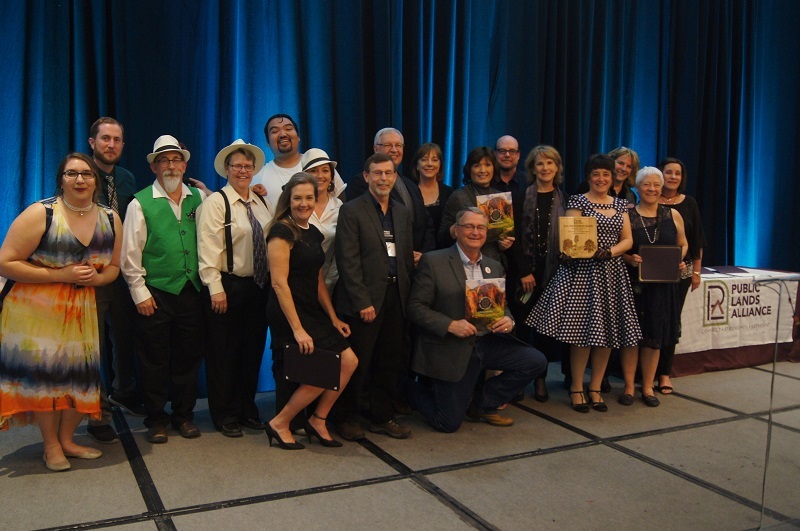 More than 370 people attended the awards ceremony during the Public Lands Alliance Convention and Trade Show in Palm Springs, CA on February 28. Impact Photographics sponsored the awards program and ceremony. A total of 13 awards were presented to individuals and organizations. In addition, there were 13 honorable mentions given along with a popular vote, Partners Choice Award. "The Partnership Awards honor the incredible efforts of the public and private sector, working together for the benefit of public lands,” said David Poteet, Board President of PLA. CANON, USA INC: For their dedication to wildlife conservation and research in Yellowstone National Park. NEW BELGIUM BREWING COMPANY: For their partnership with the Friends of the Smokies. About the Public Lands Alliance The Public Lands Alliance is a network of more than 130 member organizations that serve more than 600 public lands and contribute over $250 million dollars annually to the preservation and visitor enhancement of those lands. PLA members are found in all states and territories and provide operational and interpretive support to nonprofit organizations and their land management agency partners.